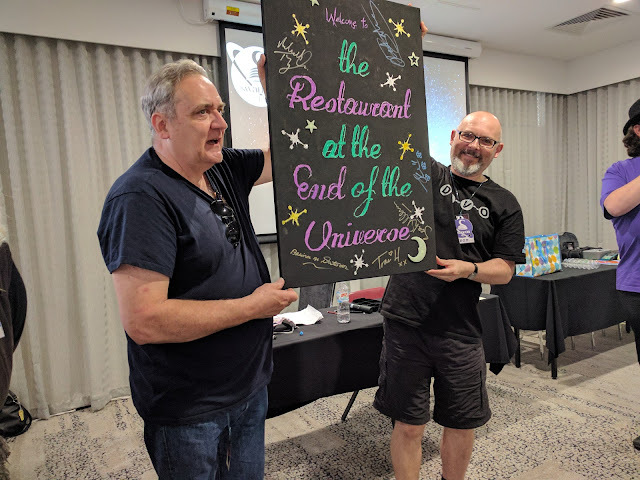 For my first large sci-fi/fantasy convention, I travelled across the country to Perth — another first, for me. SwanCon is Australia's longest running speculative fiction convention. In this, its 42nd year, the background theme was honouring the work of Douglas Adams. They had wonderful guests of honour (Michael Troughton, Joyce Chng, Traci Harding, Sean Williams, Alan Baxter, Davina Watson, and Wesley Chu via Skype). The SwanCon committee had organised a huge range of panels and activities — generally about four talks on at the same time across each day from 10am to 11pm or later; along with four or more activities running in parallel — from board games, to live action role-playing, to console gaming to children's and family activities. SwanCon 42 was held at the Metro Hotel, Perth, which did a heroic job to support the convention (and feed a large crowd several times a day). The hotel strained at the seams, but in my view can be proud of the job they did. I was also impressed by the dedication of the organising committee, and their ability to fix things and cope when things went unexpectedly wrong. The topic of the panel discussion (organised by Michael Cogan, I think), was "Publishing: Where to Begin". "Do you have a really awesome story and need a way to get it out to the masses? Come and hear from some who have been there and done it before." My most excellent fellow panellists were Amanda Bridgeman, Satima Flavell, and Glenda Larke. I think we collectively provided good information, and there were excellent questions and comments from the very engaged audience. Please understand this is not a record of what we all said, but merely some notes I made beforehand as a memory jogger. Some of these points were made by other panellists independently, in their own words. Because we had only an hour and there was a lot of ground to cover, only some of my notes were covered in the talk. The following applies after you've written your story. Before publishing, you need to have put in the effort to make it the best you can. This is critical for your first published work, since the biggest problem for new authors is being discovered and tried by readers. If you make a bad first impression, there are so many new stories coming out all the time that readers may not come back and try you again. So it pays to invest in your first story. By all means get friends or family to read your story. Note though that you're putting them in a difficult position, especially if you take criticism personally: criticism of what you've written is not a criticism of you. And if your story is not the sort of story your reader would normally read, don't ask expect anything other than finding typos and bad grammar. You're much more likely to get insightful criticism from other writers, and from avid readers in your genre. Having portions reviewed by other writers will be especially valuable to you, as will feedback from beta readers. Neil Gaiman said "When more than one person tells you something you've written is wrong or doesn't work for them, they are almost always right. When they tell you exactly what they think is wrong and how to fix it, they are almost always wrong. You are the creator: only you can know how to fix it." Most valuable of all will be a paid-for critique by a good professional editor who understands the story you are trying to write. And if you only spend money on one thing to help publish and sell your book, spend it on that, even if you have to save up for it. You learn writing by doing. When you think your work is good enough, invest some money in getting a good professional editor to critique it. It's an investment in yourself. And unlike other such professional development courses, the "practical exercise" from this "training course" directly contributes to making your story the best it can be. And you need to find an editor who ‘gets' your work and is willing to explain why they've advised what they have, and will listen to you when you explain why you did what you did. You need to be able to discuss and things when your opinion differs. Usually, then, you'll reach some agreement — often, some blending of both points of view, or some other wording or approach or scene that you can both agree on. I highly recommend ThEditors.com. They even offer a free assessment of the 1st 3k words of your work. Regarding editing, I've blogged about it here. And this article I stumbled over looking for that Neil Gaiman quote is pithy and wise. Traditional Publishing (including Indie-publishing) and self-publishing have a lot in common. If you are being published by a company, you'll also need to write a "pitch letter" and/or an outline and/or a synopsis. These are all different kinds of writing, and require time and practice to learn how to do well. They each serve a different purpose, related to making the publisher's (or agent's) job easier. Those people have hard jobs, so these communications have evolved to tell them exactly what they need to know, as clearly and succinctly as possible. There are books on the topic and web-sites, including examples of Things To Do, and Things Which Will Instantly Get Your Story Rejected If You Do Them. A key thing to know is that the people who will be reading your words have very little time and are under a lot of pressure. Try to put yourself in their shoes, and think about things from their point of view, so you can tell them what they need to know. But the other panellists (and some audience members — Alan, Sean, Bec…) know much more about that than me, since all my attempts to follow that path went nowhere! For self-publishing, you don't need to write those things, though you will need to write an excellent blurb, and ideally a tag-line for your book (the snappy/intriguing teaser line that may appear on the cover), and also "the elevator pitch". Be aware that these things, though very short, are very difficult to do and you're likely to go through hundreds of iterations before you get each of them "right". It's because they're like poetry in a way: you're trying to pack the maximum impact into few words. You have to distil everything down to its essence. However, for these far shorter pieces of writing, you can pester anyone you know for their opinion! An audience member asked if we each would recommend trying to go via the Traditional or Indie route for their first book, or just self-publish? The other panellists made excellent points, and observed very correctly that you'll get a lot of support if you're accepted for publication (especially with a small, independent publisher): you'll get an advance, they'll provide the editor, whose services you won't have to pay for, they'll write or help you write the blurb, they'll design the cover, and best of all they'll handle the marketing for the book's launch period. They all, I think, said "On balance, yes, it's probably a good idea." I however think the decision is not so clear-cut. If you self-publish, you are indeed taking on all that extra work: that of a whole publishing company — and you're probably unskilled in most of it! Admittedly, all that work is just for your story alone. But if what you're writing is the first volume in a series, the balance shifts so that it's probably better in the long run for you to self-publish, in my opinion. That's because the first book in a series is a really powerful tool for marketing. Having complete control over the cover, the blurb, how and where it's sold, and most especially, the ebook price (so you can greatly reduce it, or even make it free for short periods), is enormously helpful in getting your work found by readers, and generating follow-on reviews (typically, only something like 1% of readers will also review your book). Another reason to opt for self-publishing is my belief that we're currently only about halfway through a tectonic shift in the book publishing environment, which in future will be more like self-publishing. With self-publishing, the authors and the readers are in pretty direct contact, via social media, blogs, review sites, Facebook groups, and mailing lists. This interaction will be mediated by giants like Amazon (who are in business to make it easier for authors to sell and publish their books, and readers to discover and buy books they'll enjoy) and other ebook publishers and distributors, as well as the social media companies and purpose-built web sites that help solve the "discovery" problem. Even traditionally-published authors need a social media presence these days, since companies can only afford to market their work for roughly the "two week launch period", unless you're one of the super-star authors. Produce a print edition, too. If you produce a PDF file, that will be exactly what you'll get when you print. Though for colour parts (the cover and back), you'll need to be aware of CMYK colour and how to produce a PDF/X file with the right profile. I've blogged about that in too much detail here. Decide how you'll publish. If you're accepted by an Indie or large publisher, they'll tell you. Otherwise, you get to choose. If you're self-publishing, I think it's wise to buy some ISBNs. In Australia, you buy ISBNs from Thorpe-Bowker. One ISBN costs $125; if you buy ten, that costs $250. One hundred costs $575. Book distributors' databases tend to see contiguous ISBN numbers as belonging to a specific publisher (in this case: you). It costs nothing (or next to nothing) to apply for an ABN (Australian Business Number), too. You just fill out some forms on a government web site. Producing the ebook is very easy if you do it the right way. There's some wonderful free software called Calibre for managing your ebooks, including producing your own. It's amazing. The first time you use it, it'll probably take you some hours to learn it and set up the couple of options you'll need to alter. Each time you add a new book you've written to Calibre, it'll take you about an hour to enter in all the book's metadata (Title, Author, series info, ISBN, keywords, blurb, cover). You produce the ebook by choosing "convert to ebook" and selecting the appropriate input — typically Word format — and output: e.g. .mobi. Click Cobnvert: it will take about a minute. Replacing the book with an updated/improved version will take a few seconds; generating the new ebook version will take a minute, again. It's really that easy, thanks to all the hard work by Calibre's creator, Kovid Goyal, who has also produced heaps of good tutorials for using it (also free). I've blogged about that, here. Then, basically, you'll upload that output ebook file, and a separate cover file, to your publisher's web site. If you've chosen Amazon, or are using Amazon at all, you should register with them as an author and create your Amazon Central Author Page. Provide bio details and so on in the online forms they lead you through. You need to "Add" and link your books explicitly, manually, to your Author Page. For each edition of each book that you add and link to your Author Page, you inform Amazon of its ISBN. If you don't have one, they'll provide you with one. Though if you choose to publish them elsewhere, you'll need to use a fresh ISBN, not Amazon's one. Oh, and Amazon also make it super-easy to register that you are overseas and only 5% tax should be subtracted and handed to the US government (as long as you live in a country like Australia, that has a reciprocal tax arrangement with the US). You just fill out a form, and provide your Australian taxation number, and which bank account they should pay the royalties into. You can choose to create a print edition via Amazon, through their CreateSpace subsidiary. For my print editions, I chose a larger publisher/printer than Amazon, that also uses Print On Demand, called IngramSpark. I think it costs about $50 to sign up with them (once-off), and then it costs US$50 each time you upload a new edition/version of your book. ($25 for the cover, $25 for the contents.) So if you can get it perfect 1st time, and don't need to upload a corrected edition, you'll minimise your cost there. There's also a one-off cost ($80, IIRC) per book that you can opt-in to, to "advertise" your book. I think this just pushes your book's metadata out to all the book distributors' databases, which therefore makes your printed book available across about 29,000 stores, worldwide. Not bad, eh? One trick/note: don't tick the box that says book stores can return unsold copies. The downside is that almost no book store will stock your book on its shelves, for fear of not selling them. The up-side is that you won't lose potentially large sums of money paying for the shipping back of unsold copies if a store over-estimates how many they'll sell. They'll still order your book in, though, if asked. And of course, online booksellers in each country will happily order and ship your books to readers. You will need to set your discount to around 40% so the book store can make a profit. IS provide tables so you can work out costs and thus set your price so you make at least a small profit on each copy. I chose IS to reduce delivery costs, since the books will be printed in or near the country in which they're bought. This is in contrast to Amazon, which prints only in the US (and maybe UK)? Also, IS supports a much wider range of print edition sizes and bindings. You should inform the National Library of Australia of each edition of each of your books. It is I think worthwhile to also apply form and get a Cataloguing in Publication (CIP) entry for your book. And remember to send off a print copy (and the ebook) to the NLA after publication. I think it's also worthwhile joining the Australian Society of Authors (ASA). They've recently upgraded their infrastructure. (Remember, Luke, to re-upload all your author details into the new system.) And the Writers' Association for your state, too. Social media. The big problem for new authors is being discovered. You need to use some social media to make your presence known. Be authentic, is my advice. Be yourself, and offer useful and interesting content. Don't just repeat, in various forms, "Check out my book". But don't let social media dominate your time or energy. Limit yourself to at most an hour a day, is my own rule of thumb. Use free give-aways to attract new readers to try your work. The first book in a series is ideal for this. Never try to trick/cheat/deceive/coerce a reader. How would you feel if that were done to you? Good reviews will hugely increase your visibility, so write the best book you can. And make sure the book description sets the reader's expectations correctly: most reviewers who don't enjoy a story will give it a low rating even if they think it was really well-written. You want the people who will enjoy your book to be the ones reading it. The best thing you can do to increase your sales is to write more good books. That's a lot of interesting information. I particularly agree with your thoughts on self-publishing but most of all with the idea that the more writing you do and put out there the better it is for the writer and the readers.